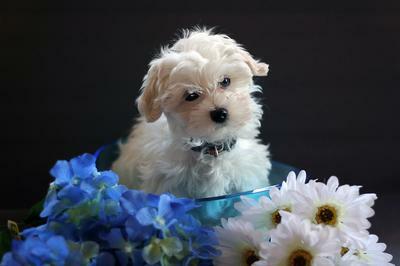 Leroy is my first Coton. He's such a sweetheart. He has the most amazing personality I have seen on a dog, eager to please, a clown at times, a sensitive soul at other times. He's my baby! Thanks guys, I will definitely check out the book and start Leroy going through tubes, once he gets the basics down ; ) He's awesome at sit and come, needs some work on lay down, stay and shake a paw. I just enrolled him in puppy class so that should be a lot of fun! Thanks again for all your advise and resources! I also taught Jonah frizbee. Now it took me almost a yr since I had not found the "101 Dog Tricks" book yet which shows a much easier way. He will stand on the bed & catch them or run down the hallway & of course outside also. I use the pool toy ones called "splash bombs." They r filled w/ the sponge stuff. This way they did not hurt his teeth. I find them @ Fry's grocery store every yr. to replace the old ones when pool toys come out in AZ. They cost US price $2.00. Just saying. They r good in agility. I am going 2 attach a link 2 a video that shows a young girl who has taught her kitty which also shows how she made homemade props. It was on my agility website saying 2 us don't say U or ur dog cannot do it. LOL. As a puppy they really do not jump until approx. over a yr. because of growing bones but I did lay pvc pipe on the grd. & then those pool noodles ($ store) on grd to practice little jumps. I found an AKC 4' tunnel w/collapsed chute attachment @ a Ross's discount dept. store 4 $10.00. I also found a cheap AKC swim lifejacket @ Petco for $10.00 since they love the water and is a good thing when pups to learn the pool. Also watch Petco's clearance section for grt8 shampoos etc. they really do a good job w/markdowns. I picked up 2 diff. size hula hoops @ the $ store which when he got older I tied the big one up ouside to practice but the little one I just let him practice walking thru in the house. I found a really good book "101 Dog Tricks" by Kara Sundance & Chalcy @ Petco which I spend an hr. reading their before I purchased. USA $18.99, UK money $12.99 & Can. @22.50. They broke down w/pictures much easier ways then I has ever learned. Contains agility, obedience, hunting, retrieving, jumping, dance & versatality tricks step by step instructions. Every thing in 1 place. Most agility clubs also let u work @ the shows 2 earn pts. 2 help w/cost of classes. Hope this helps. We are extremely proud of him. Everyday he surprises me. He's just under 4 months old and last night I thought, the snow is gone time to see if he will play fetch. I was fully expecting that I would throw the ball and do the fetching. But with the first throw he brought the ball right back and drop it at my feet, sat down, gave me that side to side look, like he was saying, "Is this where you throw it again?". It truly blew me away. Anne you are right, I always get the feeling there is a little wise man in that fluffy little body. Vicky & Jonah we are truly enjoying him. Question for you, are coton's good at agility? He is absolutely gorgeous and it is such a cute picture. Congratulations on ur new puppy. They r wonderful dogs w/a big personality. Enjoy ur puppy & I hope u share many more pictures and stories. LeRoy is precious!!!! He sounds like a real champ and the best thing about Cotons is their personality and energy. You are very lucky to have found each other. By chance, we adopted a Coton and have been fascinated with this breed ever since. I swear that there is a person inside our little Molly. The sensitivity, the way she talks with her eyes to you is just unbelievable. Molly has been part of our family for 2 3/4 years and we are still besotted with this little dog. She has captured our hearts. Sounds like LeRoy has done the same. He certainly is the cutest dog ever.